IMPORTANT:data loggers require software (USB interface cable included w/CD purchase) and a communications device. See compatible items below. The HOBO UX120 Pulse Logger is a highly versatile, 4-channelenergydata logger that combines the functionality of four separate data loggers into one compact unit. It enables energy management professionals – from energy auditors to building commissioners – to easily track building energy consumption, equipment runtimes, and water and gas flow rates. 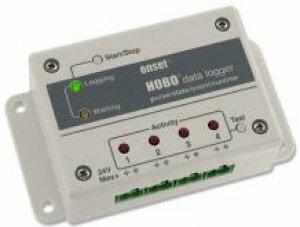 The HOBO UX120 Pulse Logger is available in astandard memory model (UX120-017)capable of 500,000 measurements and anexpanded memory version (UX120-017M)capable of over 4,000,000 measurements. Works with Onset'sEnergy & Power Meterto measure Power Factor (PF), Reactive Power (VAR), Watt Hours (Wh) and more.